The story is about a girl who was called “ugly” by a boy, the first and only person to whom she confessed her love. This incident sparks a life change, and as a result Sunako shuns all forms of beauty, both in herself as well as in life. 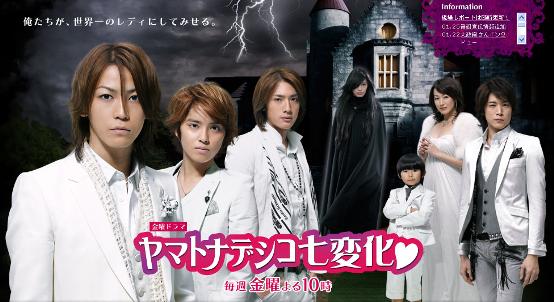 Concerned by her change for the worst, Sunako’s aunt, the owner of a beautiful mansion where four very handsome students live, offers the guys free rent in her mansion if they can turn Sunako into a “perfect lady” (referred to in Japan as the titular Yamato Nadeshiko). While the four of them manage to make Sunako physically beautiful enough to become a lady, the problem lies with her attitude and interests (which Sunako has no intention of changing). Up until the most recent release in the story, they’ve managed to convince Sunako’s aunt that her niece is indeed a lady befitting the mansion in which they live (and prevent the rent from skyrocketing to triple the required amount). However, in reality, Sunako has not changed considerably. 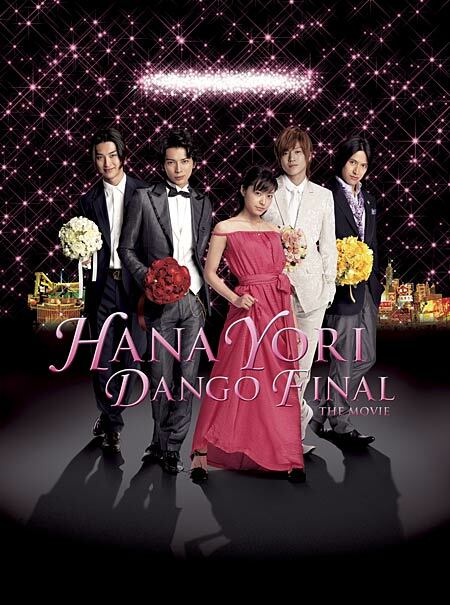 Hana Yori Dango Final (花より男子F (ファイナル) Boys Over Flowers Final?) is a 2008 Japanese film, directed by Yasuharu Ishii, and starring Mao Inoue and Jun Matsumoto. The film is the last chapter of the Hana Yori Dango trilogy in Japan. 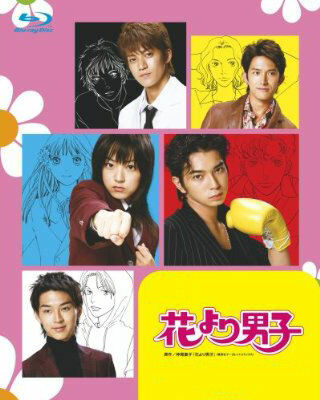 Hana Yori Dango was originally a manga that inspired a TBS TV drama that got huge ratings over two seasons. The show started with the trials and tribulations of “tough weed” Tsukushi Makino (Mao Inoue) as one of the only poor girls at her ultra-rich high school, Eitoku Gakuen. She ran afoul of the “big men on campus”, collectively known as F4, who in turn made her life completely miserable. However, over the span of the first season the leader of the group and richest kid at the school, Tsukasa Domyoji (Jun Matsumoto) fell in love with her, much to the dismay of his snobby mother who spent the better part of both seasons masterminding elaborate schemes to break them up. The film picks up after the show, with the couple finally prepared to get married. Domyoji’s mom even seems happy for them and gives Makino a family heirloom: a tiara worth 10 billion yen called “Smile of Venus”. Of course, being Hanadan, nothing is ever easy — so a thief eventually breaks into their hotel room, steals the tiara, and leads the couple on a madcap adventure around the world. Can they recover it before Domyoji’s mom finds out it’s missing and dooms their wedding? Maybe with the help of F4 and special appearances by almost every side-character ever to appear on the TV show. Hana Yori Dango Returns is a Japanese television drama series, broadcast on TBS in 2007. Hana Yori Dango returns for a second season, picking up the story a year after the events of the first season. After having fallen victim to a plot by Jun Pei and puzzled about the real status of their relationship (he had been ignoring her calls for months), Tsukushi flies to New York. There, she gets lost and becomes a prey to thieves and bad men. She meets Rui (who saves her in the nick of time), Sojiro and Akira. Tsukushi finds, upon seeing Tsukasa for the first time in 12 months, that he has changed. Upset with his cold attitude, Makino (with the F3) returns to Japan. During her son’s birthday party (to which Makino had been invited), Kaede announces his engagement to Okawahara Shigeru, the only daughter of a Japanese oil magnate. To make things complicated, Shigeru falls in love with her new fiance and befriends Makino. She decides to make Makino her love adviser and confidante. Makino, in an effort to deal with the painful events regarding her past love, immerses herself in her studies to get into law school with the help of Rui. As they grow closer, Rui realizes his feelings for her. He kisses Makino, angering Domyouji. Meanwhile, Nishida, the company secretary finally tells Makino the real reason for Domyouji’s change of behavior which leaves Makino confused. In a twist of fate (and with Tsubaki’s scheming), she stays inside the Domyouji mansion and works there as a maid. She befriends Tama, an old housekeeper of the Domyouji clan. Domyouji eventually breaks off his engagement to Shigeru and pursues Makino. This results in his disinheritance and further worsens the crisis faced by the Domyouji World Finance Group. In an effort to save him and the employees of the company, Makino breaks up with Domyouji and follows her family to a fishing village to start a new life. Tsukasa goes after her, however. There, he gets into an accident after saving Susumo and develops amnesia. Her attempts at helping him revive his memories are thwarted by Umi, a seemingly sweet and friendly girl who had all along wanted him for herself. After saving Makino from being frozen to death in a blizzard, Domyouji finally remembers her as the “first girl he has ever fallen in love with” as the circumstances were similar to their disastrous first date in season 1. He then proposes to her after her prom, with their friends and the rest of the Eitoku students cheering them on. The series ends with Tsukushi and Tsukasa meeting up for their date at Yebisu Garden place, this time as an engaged couple. Hana Yori Dango is a Japanese television drama series, broadcast on TBS in 2005. It was one of the most popular dramas of the year and won many major awards. It is the live action version of popular manga Boys Over Flowers. Makino Tsukushi is a tough, hard working, lower middle-class student at the prestigious Eitoku Gakuen school attended by the rich and influential. Worse yet, the school is ruled by the handsome, powerful, and influential F4 or Flower 4, who bully fellow students out of boredom or spite and who nobody dares to challenge. That is, until Makino came into the picture. Tsukushi is immersed into the lives of the F4 after defending her friend, Sanjo Sakurako. She receives a red tag from F4, and as a result, the whole school turns against her. Despite the harassment, Tsukushi, the “tough weed”, decides to clean up the F4’s act and declares a war back on them. Her defiance and steadfast resistance ironically earns the respect and love of the F4 leader, Domyouji Tsukasa. But Tsukushi is in love with the Flower 4’s mascot boy and Tsukasa’s bestfriend, Hanazawa Rui, after he saved her a few times from the hazing by the student body. The courtship between the two leads Tsukasa and Tsukushi is the main subject throughout the series. Various challenges threaten their blossoming relationship, such as the envy of fellow students, an obsessed childhood classmate, discrimination, differences in social class, Tsukasa’s violent and possessive nature, and most especially the loathing of Domyouji Kaede, Tsukasa’s mother. The first season ends with Domyouji giving the saturn necklace to Makino and Makino’s confession of love right before Domyouji leaves for New York.